And I definitely would not have paid this place a visit had it not been recommended by a few readers, and a friend of my family’s. Read on to find out why this restaurant deserves to be mentioned alongside the other eateries at De Garden, and still hold its head up high …. Nasi Lemak with Curry Chicken (RM7.90/USD2.50) – The mass of sambal on top right was actually mashed chili tuna, highly suspected to be from cans. But somehow, I was not complaining much. And so we were at lost at what to eat one fine evening. De Garden does not promise any particularly memorable restaurant for those seeking for a simpler (and maybe healthier) meal without the need to splurge. Something basic like a plate of fried rice, noodle soup or even porridge. But Lite Desire actually cooks up a rather enviable array of homecooked dishes; from specials like Red Wine Mee Suah (surprise, surprise), Thai style Fried Udon and Salted Chicken with Rice, to classics like Nasi Lemak with a choice of different meats, Char Kuey Teow, and simple porridge with century egg. Pricing-wise, I wouldn’t say it’s comparable to your typical hawker fares around Ipoh. In fact, the foods here are in the league of cafe prices and kopitiam fares. But there ends the similarity. For Lite Desire does make up with ample portions, wholesome and not sloppily cooked/presented dishes, as well as changing their specials from time to time. Yes, we even heard the next table asking for roti canai, but sadly they decided not to serve the Malaysian famous Indian flatbread that evening. Imagine having roti canai in a Chinese restaurant; in an enclosed seating arrangement with air-conditioning. Even the soup was screaming HEALTHY FOOD. Floated on the surface was some wolfberries (goji/kei zhi) and chrysanthemum. The Nasi Lemak was not laden with coconut milk, but with a faint hint of a pleasant ‘pandan’ (screwpine leaves) aroma mixed with a slightly creamy taste from the santan. Healthier than the usual? No sambal was served, but instead they chose to serve mashed chili tuna, a whole sliced boiled egg, curry chicken with a distinct kick, crispy anchovies and peanuts as well as a few pieces of papadom crackers. Though not the best nasi lemak you can find out there, but still passable and definitely better than Old Town’s or Pappa Rich’s. The first picture depicted the most memorable dish of the evening; an aptly-named Tri Color Fillets with Lai Fun. 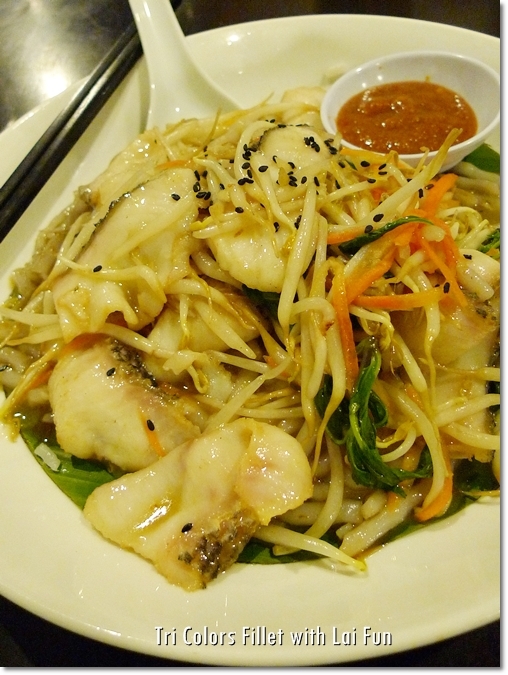 Very healthy combination of short rice noodles, various vegetables and sumptuous slices of grouper fillet garnished with black sesame seeds. Meanwhile, the Herbs And Salted Chicken could be a favourite of anyone’s, from the young to the old. Just imagine a whole chicken thigh, salted and marinated with herbs then smoked/roasted ala Ipoh’s famous salted chicken. Served with white rice, a dipping sauce and a bowl of soup with chrysanthemum and wolfberries. They pride on their coffee, NOT brewed from 3-in-1 sachets. 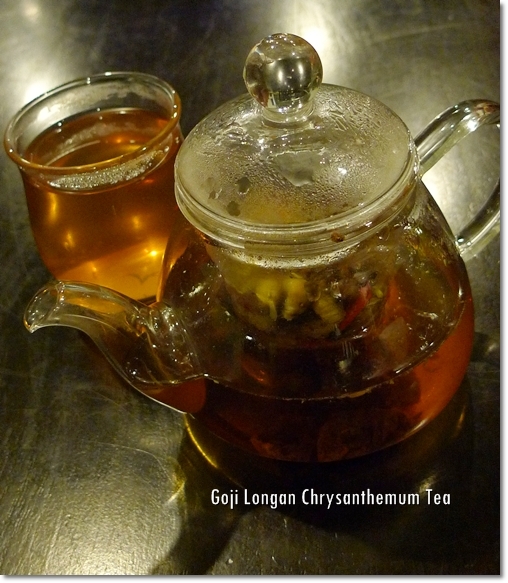 And they offer a variety of healthy brews, like the Goji Longan Chrysanthemum Tea in the second picture, and Pu-Er tea above. 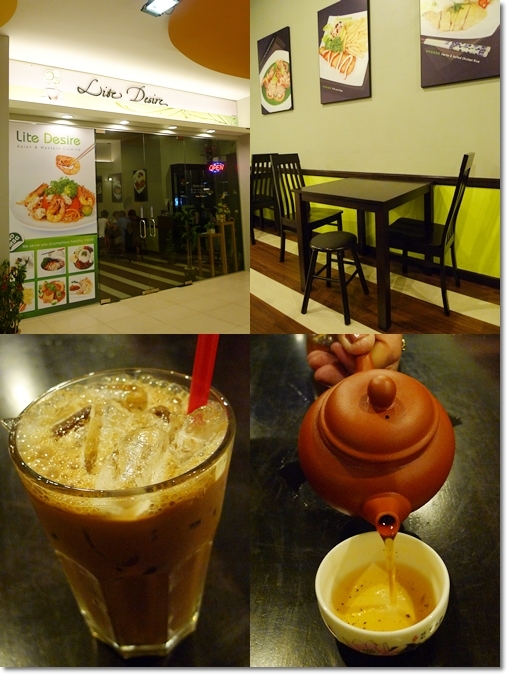 Although at one glimpse, the menu consists of the usual Asian-Western cuisine widely available in other similar kopitiams, you will be amazed at how different Lite Desire really is. The couple running the restaurant came back from Canada, and planned to start this venture 9 months ago. Very ambitious and taking some calculated risk, given the fact that renting a lot at De Garden costs a few thousands per month at least, and the retail outlets on the upstairs are not exactly parked at the most strategic of location. But I do admire their perseverance and determination in standing out from the crowd;an amalgam of influences such as fast food chains, regular kopitiams, snack kiosks and big time restaurants populating De Garden. The next time you’re at De Garden and seeking for a simpler and fuss free meal, give Lite Desire a try. The tranquil surrounding alone is worth a visit. Opens : Sun-Thurs : 10am-10pm, Fri-Sat : 10am-1am. You can also read Simple Girl’s review HERE. Just a Lego type of construction cost people RM5k~RM10k rental per month (Here is Ipoh leh… not KL). Who have to suffer for it…. We the consumer have to suffer and pay for it…. If the business is not so good, the tenants have to suffer for it. Further more we frequently face problem on parking issue… Every time me and my family have to park at Jusco and walk pass through the road… That why we seldom venture to de Garden…. maybe 1 year twice or once…. Agree. I’m living nearby and within walking distance but I’m not venturing anywhere near here because De Garden does not seem to respect nearby residence. Damn noisy at night with all those singing. Wait and see lah, wait till the residents gather to hold a mass protest, something similar to the protests at the then Bali Bali. 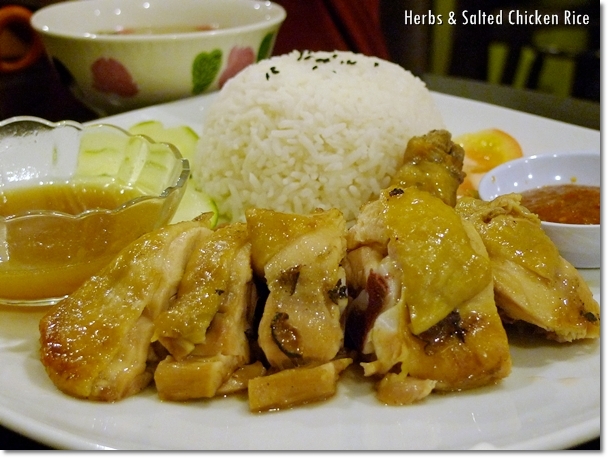 Herbs salted chicken rice? Sounds cool to me.. I like the combinations, must be delicious 🙂 Oh.. the soup is simply yet i think it is quite nourishing there.. nice post..
p/s. 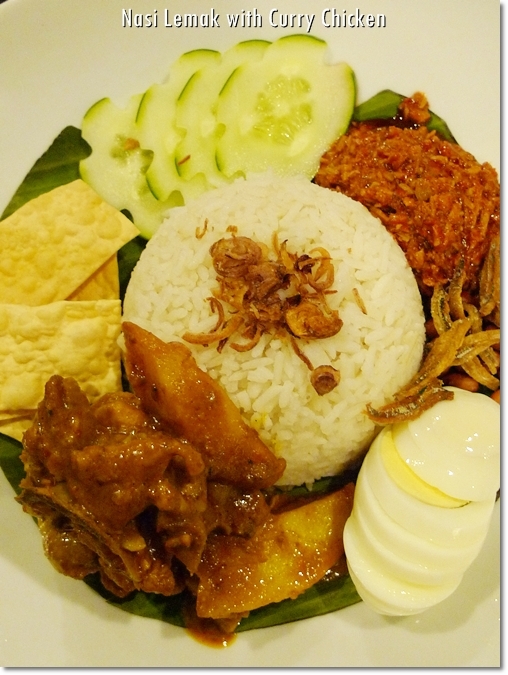 The nasi lemak reminds me of the one at Sakura @ Jalan Imbi.. It’s extremely tasty to me..
very light and desirable indeed! Still, i’d probably have trouble finishing it;) looks big! Portion looks big and price wise comparable to Pappa Rich. Somemore parked on top of Pappa Rich, I foresee this restaurant having some tight competition? U Cakap macam ini takkan ada peluang saya nak jumpa ulah! Is real reply now-Rental Pappa Rich is more expensivemah!!!!! 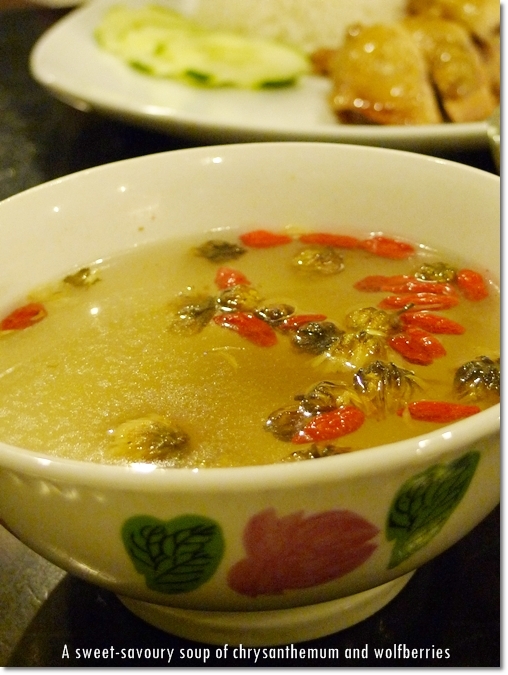 chrysanthemum in soup? I guess it must taste slightly bitter? food wise, still need improvement but with their attitude, i’m sure they can reach there in time. Thanks!BECAUSE u give me the chance! Huh? vvenus you’re someone from Lite Desire? rather disappointing … the rice paper popiah was not available. however, the service was quite good as the owner informed us that we would have to wait …. according to the owner there will be a new menu coming out soon ..
Oh i see. I assumed that the disappointing part would be from the rice paper popiah not available? Rather than the quality of the food. I like their Nasi Lemak the most. Yeah, definitely one of the better place for FOOD (Real food, I mean) at De Garden.